The President, Muhammadu Buhari, says that Nigeria’s greatest resource is its human capital and pledges his administration’s continued support to its effective development. President Buhari stated this while declaring open the third Science, Technology and Innovation Expo 2019 at Enugu. Represented by the Secretary to the Government of the Federation, Boss Mustapha, the President stated that the Expo affords entrepreneurs to showcase their research results, inventions, innovations as well as products and services that can be commercialised. He noted that “the gains attributable to various programme initiatives by the Ministry which have resulted in job creation opportunities, skills acquisition and entrepreneurial development.” On effective provision and application of Science and Technology, the President affirmed that it will take the country to the next level of prosperous, strong and stable nation. In order to realise such a goal, he disclosed that his administration has employed the use of Science, Technology, and Innovation to crystalize the Economic Recovery and Growth Plan (2017 – 2020) and applied it in all aspects of the economy. The President made it clear that the government will support the creation of intervention funds to strengthen Research and Development, training programme and partnership with tertiary institutions, technical schools and Trade Centres in the area of research. For this to be achieved, he promised the consideration of the National Science Research and Innovation Fund Bill in order to remove observed grey areas for its passage into law. Earlier in a welcome address, the Minister of Science and Technology, Dr. Ogbonnaya Onu, underscored the importance of Science and Technology as a weapon to fight hunger, disease, illiteracy, poverty and underdevelopment. DR. Onu said, the Expo, the third in the series, and the first to be held outside the Federal Capital, is aimed at building a knowledge-based economy, that is innovation driven. The Governor of Enugu State, Rt. Hon. 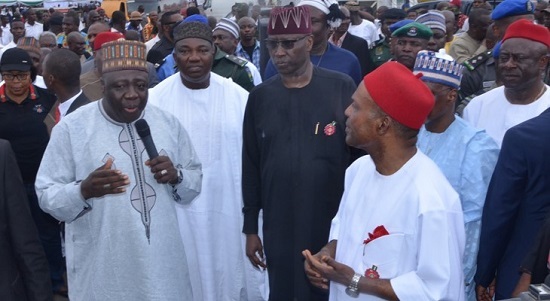 Ifeanyi Ugwuanyi, thanked the Federal Government for choosing the state for the Expo and promised to partner it for sustainable growth and development. Automatic scholarships for three young scientists who excelled at the 2018 Young Scientists Competition were given as follows: Favour Obiajulu Okeke, Federal Capital Teritory; Daniel Fisayo Fafemi (Kwara) and John Mark Joshua (Akwa Ibom). Participants at the Expo are drawn from within and outside Nigeria including Portugal.